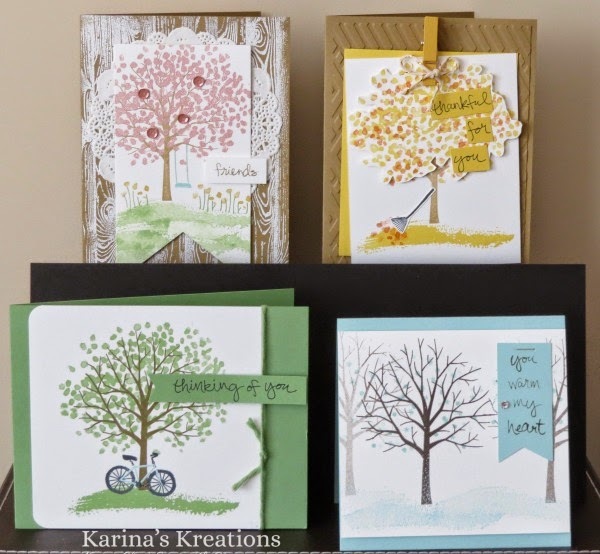 Karina's Kreations: Stampin'Up Sheltering Class! One of my favourite stamp sets in the occasions catalog is the Sheltering Tree stamp set. The set can be used in any season. I'm running a special class on Wednesday March 18 12:30-2:30 or 7:00-9:00. We're making these 4 cute cards and you'll go home with your own Sheltering trees stamp set. If you already own the stamp set, place any $40.00 order and your card class is Free. Email me at kchin2@telus.net to save your spot. I'm offering this class as a kit to go. I'll mail you the stamp set, card kit and instructions for these cute cards.